Free Printable December 2015 Calendar. Make your plans for this month of December 2015. 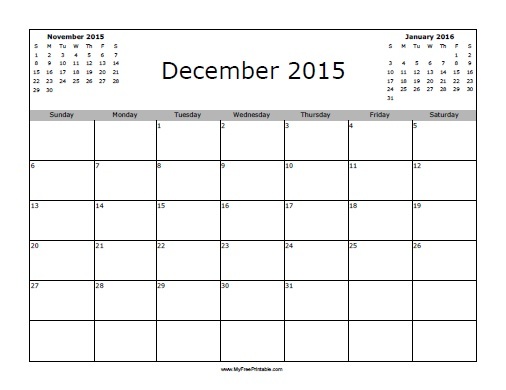 Print the December 2015 calendar to write all you need to remember this month. All the calendars include the previous month November and next month January. Select the one you prefer from starting the week on day Monday or Sunday. Very useful free printable to have close to you to write important things to do this holiday season like Christmas Gift Shopping, Christmas Sale, church Christmas day activity, community charity events in December 2015. Click the link of your choice to download or print now. Instructions: The print link will open a new window in your browser with the PDF file. Then you can print or download using your browser’s menu.